Protestors rallied at JFK Airport against the Muslim immigration ban Saturday. Technology leaders like Airbnb CEO Brian Chesky and Lyft co-founders John Zimmer and Logan Green this weekend pushed back on Friday’s executive order by President Donald Trump to temporarily bar people from seven Muslim-majority countries from entering the United States. Chesky took his activism a step further Saturday night when he offered free lodging to refugees around the world who were caught in limbo because of the ban, via his home-rental platform. As almost anyone who’s followed the news in the last 48 hours would know, Trump banned citizens from Iraq, Syria, Iran, Libya, Somalia, Sudan and Yemen from entering the U.S. for at least 90 days. According to CNN, a senior White House official said the development likely represented an initial move toward a broader ban on immigrants and foreign travelers. 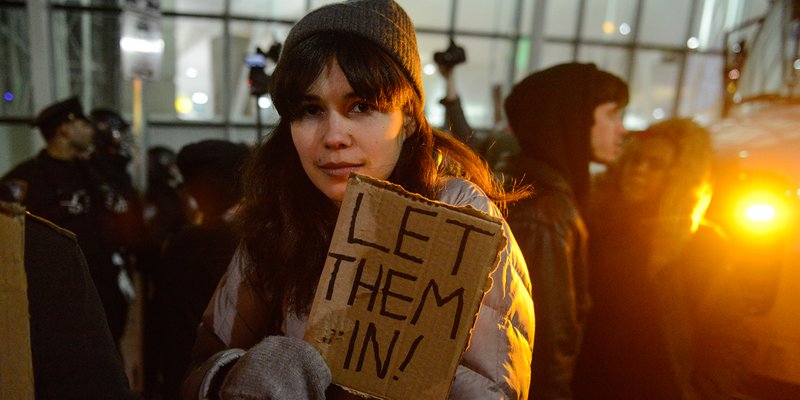 Thousands of Americans protested at airports across the nation Saturday to repudiate the detention of refugees because of Trump’s ban. Those protests became major stories on social media and cable news, dominating chatter. Just after 9 p.m. ET, word broke that American Civil Liberties Union lawyers won a national stay on Trump’s ban from a federal judge in Brooklyn, New York. So it appears that a court battle to decide the issue is afoot. Then, Zimmer and Green this morning emailed Lyft customers to say the ride-sharing service would donate $1 million to the ACLU. Uber attempted to counter the criticism with a blog post from Kalanick, who said he would compensate drivers affected by the ban and pledged to raise concerns about the ban at an upcoming advisory meeting with Trump’s administration. Other industry peers also voiced concern over the ban. Jack Dorsey, CEO of Twitter and Square, tweeted about the value of immigrants. And in a public Facebook post, Netflix chief Reed Hastings said the measure was affecting his employees and endangering the country. Reuters reported that Apple CEO Tim Cook sent a letter to employees explaining what it’s doing to combat Trump’s order. “We have reached out to the White House to explain the negative effect on our coworkers and our company,” Cook wrote.